A long time ago in China, there lived a kind young man named Yan. He was very respectful to his elders and especially kind to animals. He lived alone and had no wife. There was one girl that he found pleasing to his eyes. But she was the daughter of a rich man who would not allow her to marry anyone who could not afford a large "bride price." "No man will marry my daughter," said the wealthy man, "Unless he can bring enough jewels or enough money in a lucky red envelope as a wedding gift." Collecting a "bride price" was a custom that the parents of the bride followed in China. But, the price was almost always determined by how much money the groom had. Most families were careful not to charge too much for fear of looking like they wanted to sell their daughters. Yan owned only one jewel. It was in a ring given to him by his mother years ago. He wore it around his neck. Perhaps his wife one day would wear it, but he would not give it up to this greedy man. Yan went to work for the rich man in hopes of showing him that he could be a good worker and a good son-in-law. Still the man treated him very badly and made him work harder than his other employees. He did not pay Yan as much as he deserved. He did not want a poor man like Yan to marry his daughter. One day, Yan was in the mountains chopping wood. He worked hard all through the morning. When he stopped for lunch, he laid his head on the ground in the warm sunshine and closed his eyes. As he laid there, he began to hear the happy squeals of a group of monkeys that played in the nearby trees. Yan wanted to see what the monkeys would do and laid very still and did not move when the monkeys surrounded him. Another monkey said, "It does not move like a man." The monkey pulled Yan's hair. But Yan did not move. "I think it is a statue," said the monkey. A third monkey lifted up Yan's eye lid. But Yan did not move. A monkey put a piece of grass in Yan's ear. But Yan did not move. A monkey opened Yan's mouth and pulled on Yan's tongue. But Yan did not move. A monkey put a finger up Yan's nose. But Yan did not move. "It's a statue," said the monkey. "A human would have moved." Then a monkey hit Yan in the stomache. Air was forced out of Yan's stomache making him say, "Uhhhh!" "I know what it is," said a monkey. "It's a drum!" He hit Yan once. Yan went, "Uhhhh." Three times, "Uhhhh, Uhhhh, Uhhhh." "What a great drum," said the monkeys. "It's a Big Man Drum. Let's take it back to our cave and play it. We have a Big Man Drum." "Uhhhh, Uhhhh, Uhhhh, Uhhhh Uhhhh - Uhhhh, Uhhhh"
"We have a Big Man Drum - A Big Man Drum. Let's lift him in the air - And handle him with care." The monkeys picked up Yan and held him over their heads and began to carry him up the mountain toward their cave. One monkey sat on Yan's stomach and drummed as the monkeys moved along. Please don't drop Our Big Man Drum. Please don't drop Our Big Man Drum. The monkeys began to cross a wide and deep ravine over a rushing river far below. They held on carefully to Yan as they crossed on a vine bridge. Yan kept his eyes closed tightly and did not move. The monkeys ran up the mountainside and carried Yan into their cave. They laid Yan on a table of stone inside their cave. "The Big Man Drum is Ours. Let's cover him with flowers." The monkeys began to cover Yan with flowers. They put flowers in his hair and in his ears. They even stuck a flower into his nose. Then one of the monkeys saw the shiny ring that hung from Yan's neck. "Oooh," said the monkey. "Pretty stone." Then he ran to his sleeping place and brought back red and green stones and laid them next to the ring. 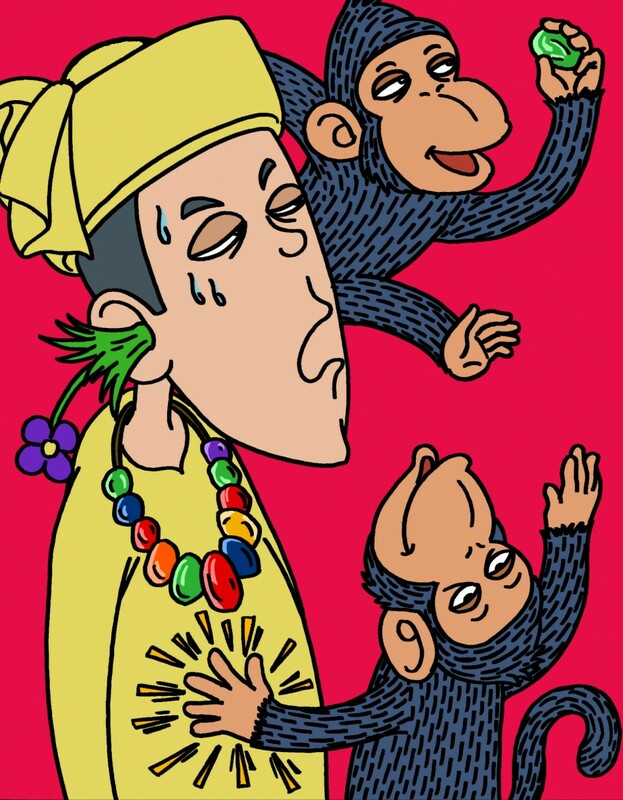 Other monkeys ran off to find colored strings and chains and shiny stones. Yan opened his eyes a tiny bit and saw that the monkeys were covering him with jewels and necklaces and bracelets of all kinds. He closed his eyes and did not move. Now let's play Our Big Man Drum. Now let's play Our Big Man Drum. The monkeys played and danced late into the night. Then they all crawled off to their sleeping places. When the monkeys were all asleep, Yan carefully got up and climbed down from the rock. He carried all of the jewels he could and hurried back to his village. He was very careful crossing the vine bridge over the rushing river. He sold enough jewels to buy a farm and build a home for himself. He used some of his money to help poor people in the village and he kept the rest of the jewels for the day when he might have a family of his own. It only took a short time before his former greedy employer found out about Yan's new wealth. "You have enough money for a 'bride price' for my daughter," saidthe greedy man. "Shall I bring you a big red envelope so we can talk about your marriage?" "No, thank you," said Yan. "I do not wish to buy a wife when I decide to marry." But, the greedy man bothered Yan until Yan finally told him how he got his jewels and money. As soon as he heard Yan's story, the greedy man went home for large bags to carry more jewels than Yan had brought home. He left right away for the mountain where Yan found the monkeys. The greedy man laid on the ground and closed his eyes. In only a few minutes, he began to hear chattering of monkeys. He did not move. Soon monkeys surrounded him. One pulled his hair. Others poked fingers in his ears, mouth and nose. Still he did not move. "It's our Big Man Drum," said one monkey. Then he hit the man once in the stomache, "Oww!" Three times, "Oww, Oww, Oww." Then "Oww, Oww, Oww, Oww, Oww." "Our drum does not sound as good," said the monkeys. "But, let's still take it back to our cave and play it. "Oww, Oww, Oww, Oww, Oww - Oww, Oww!" The monkeys picked up the greedy man and held him over their heads and began to carry him up the mountain toward their cave. One monkey sat on his stomach and pounded on him as the monkeys moved along. Yan remained still and only made sounds when the monkeys drummed on him. The monkeys began to cross a wide and deep ravine over a rushing river far below. They held on carefully to greedy man as they crossed on a vine bridge. But, the man opened his eyes and screamed, "Don't drop me!" His shouting scared the monkeys, and they dropped him into the fast moving river below where the waters carried him away. Back home, Yan gave his ring to the daughter of the greedy man. With her greedy father gone, she became the loving wife Yan had hoped to find. The two lived happily together. "We had a Big Man Drum. We had a Big Man Drum.